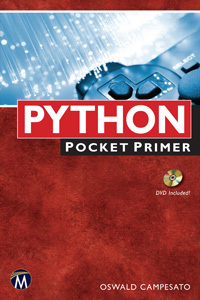 Boston, MA, May, 2014: As part of the new Pocket Primer series, Python Pocket Primer provides an overview of the major aspects and source code to use Python. This Pocket Primer is primarily for self-directed learners who want to learn Python and serves as a starting point for deeper exploration of Python programming. Oswald Campesato (San Francisco, CA) specializes in D3, Java, Android, jQuery, and CSS3/SVG graphics. He is the author/co-author of fourteen books including jQuery, CSS3, and HTML5 for Mobile and Desktop Devices and HTML5 Pocket Primer (Mercury Learning). MEDIA INQUIRIES: Contact Jean Westcott at 1-800-758-3756; Fax 703-661-1501; Email info@merclearning.com. FOR ACADEMIC/EDUCATIONAL REQUESTS, please complete the online form at: http://www.merclearning.com. Then click on “Textbook Review Sample” tab. Digital versions available at authorcloudware.com or on Kindle. © 2011 Mercury Learning and Information. All Rights Reserved.